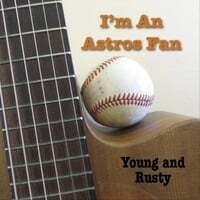 An ode to the Houston Astros from Austin duo Young and Rusty - a homegrown acoustic song in the Texas troubador tradtion. Rusty Nelson has been a Houston Astros fan since he was 8 years old. Sue Young jumped on the bandwagon last season as the team battled their way to become World Series Champs. Rusty wrote a song for all the fans like him who have been waiting decades to see the Astros go all the way. Young & Rusty Young and Rusty is a Folk and Americana duo from Austin, Texas. Sue Young's pure voice and Rusty Nelson's rough edged vocals combine in a perfect blend. Their songs and sound evoke a simpler time; cruising down a country road, wading in a cool creek, or taking a ferry boat ride across the Mississippi. Their 2017 release "Comeback Coming On" debuted at #21 on the Folk DJ Chart and got airplay around the world. Their 2014 debut EP release "Back Road Love" made the Folk DJ charts and the top 30 albums of 2014 on Al Kniola and Norm Mast's "The Back Porch on WVPE FM.